That’s what I’m doing – holding the phone. I’ve finished off my soup and salad, and am now reduced to listening to bad Muzak® on a loop, brought to me courtesy of the Department of Motor Vehicles. So to distract myself for the rest of lunch, I’m choosing to blog about the experience. Why should I be the only one to suffer? As an introvert whose career has long been in the digital realm, I’ll do just about anything to avoid talking to a live person, so this is kind of killing me. Yet when the DMV’s message warned me of a two-hour wait due to “high call volumes”, I decided to go all-in out of sheer stubbornness. At least, I think the message said two hours — I kind of blacked out right about then. I’m on hold because my registration and license plate tags expire today, and I’ve yet to receive new ones despite the fact that my check to the DMV cleared four days ago. It could be an especially ambulatory weekend, if I don’t get this sorted out. I tried researching my status online, but no luck. Under normal circumstances, one might assume that since the check cleared I have nothing to worry about. The DMV would not have processed my payment if there was anything wrong with my renewal – certainly not without informing me – because, you know, that would not be logical. However, this is the DMV we’re talking about. I learned this lesson a few years after moving to San Francisco from New York City (where I was carless). I submitted my registration renewal form but forgot the required smog check certificate. The DMV cashed my check, but never bothered to let me know I shouldn’t be expecting any tags. It was a big mess. 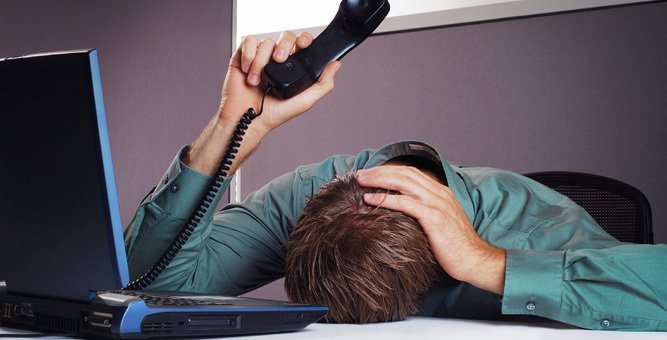 Why is on-hold music so awful? I mean, I assume it exists in part to assure the person who is holding that his/her call has not been dropped. But I suspect it’s also a tool to dissuade us from holding out for a costly human interaction. Sadly, I can’t put this call on speakerphone, or my colleagues will toss me out the window. And I can’t turn down the volume on my headset, because I need to know when/if a representative finally picks up. After several unsuccessful attempts to find the right phrase, the voice recognition system does understand when a caller shouts “IDIOTS” into the receiver. I tested it. It’s how I made it into the queue, where I’ve been for the past hour. Pity the poor sucker who doesn’t know that trick! Just as I thought I’d run out of DMV anecdotes, someone picked up. She was very nice, and explained that my registration would be mailed out next week. Um… next week? The agent explained that the check goes to one department, but the registration is handled by another. Of course! This is the DMV! The department that delivers your service will always be slower than the one that relieves you of your cash. If not, anyone feel like taking a long walk this weekend? I’ll even let you carry my grocery bags home!